No. 37, Jalan Masai Utama 2, Taman Masai Utama, 81750 Masai, Johor, Malaysia. below which more than enough for pipelines flushing. The purpose of chemical flushing is to remove any dirts, debris, oil, grease, rust, scale, ect form the pipelines. During chemical flushing thin layer of surface of pipe wall will remove as well all the unnecessary contamination. This chemical cleaning also will reduce the oil flushlng cost in term of flushing time and number of oil flushing materials use such filter elements. The conventional chemical flushing involve alcaline as first degreaser to remove grease, oils and fat following by acid as second rust and scale remover and following of nutralisation as third stage and corrosion inhibator as final stage. During this process temparature and chemical pH level must be carefully monitor and control in order to complete the process with high quality result. Small mistake will cause a lot of problem where the whole process may need to carry out again which not only cost money but time comsuming too. 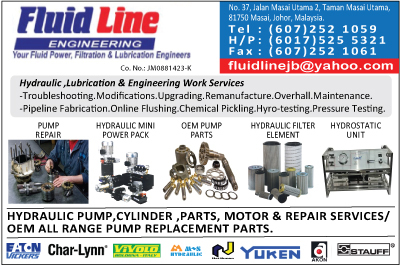 The Pump and Valvw Department at Fluidline Engineering has repairing and testing all brands of pump,motor and winches.We specialize in excavator component. With FLE you have the confidence that your pumps,motors or valve will be repaired correctly the first tiame.We have years of experience and separate test stands.No unit leaves our shop without being fully tested for maximum performance capability.